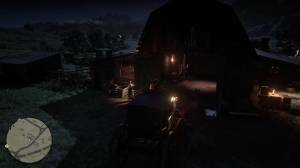 It’s recommended to do this criminal activity after unlocking the wagon fence in Emerald Ranch (complete The Spines of America mission) so you’ll have a place to sell the hijacked/stolen wagons for a good amount of money. The flatlands around Emerald Ranch is a busy trade route so it’s easy to find potential targets to rob. 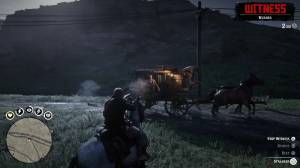 Later on in Chapter 3, after completing the mission Friends in Very Low Places, you’ll have access to six more story-related coach robbery missions. Unfortunately, only Seamus, the fence in Emerald buys a whole coach or wagon. 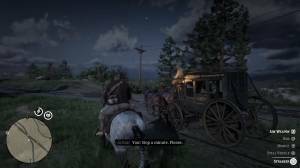 To rob stagecoaches, you have to be on horseback and ride along the targeted coach or wagon. Make sure to wear your mask then approach the target wagon. Call out to the driver to get their attention. From there, you can have the to rob (declare the robbery) or hijack the vehicle. After declaring the robbery, you’ll have the option to threaten or beat the driver, or even outright kill him. After successfully eliminating or hogtying the robbery victims, make sure to hop on the wagon/coach and leave the main road immediately. This will lower the risk of running into witnesses who may report the crime. For cargo wagons, your job is done at this point but for passenger coaches, you also have to deal with the passengers first since they’ll most likely attempt to escape and report the crime. You can deal with the witnesses by threatening them, capturing and hogtying them. Some passengers can even be interrogated for information about lockboxes inside the vehicle. Once you’re done, finally drive the coach back to Emerald Ranch to sell it.